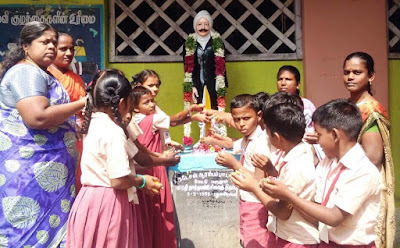 NGO News blog, NewsLine: Rich tributes were paid to nationalist poet Subramania Bharathi on his 135th birth anniversary in SEVAI Natesan School in Mettumarudur. 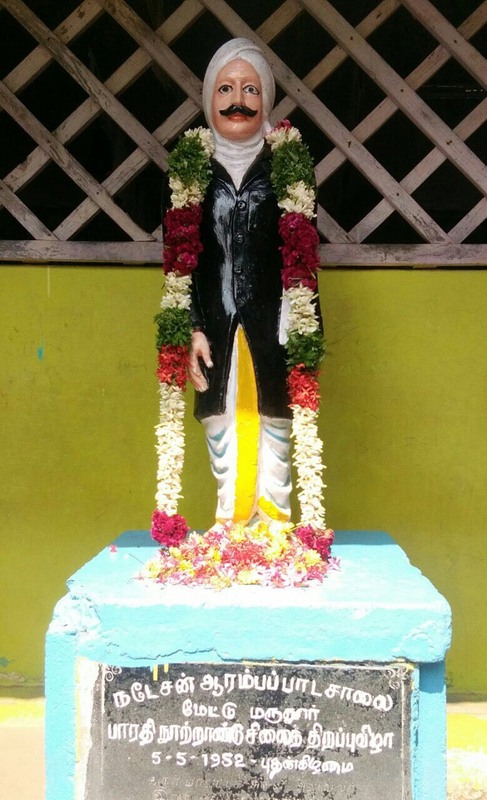 Rich tributes were paid to nationalist poet Subramania Bharathi on his 135th birth anniversary in SEVAI Natesan School in Mettumarudur. paying rich tributes for Subramaniya Bharathi. Mrs.Kaliammal,Head Mistress,teachers and pupils of SEVAI Natesan school in Mettumarudur paid rich tributes at the revolutionary poet's statue situated in the School premises of Subramaniya Bharathi (1882-1921.. 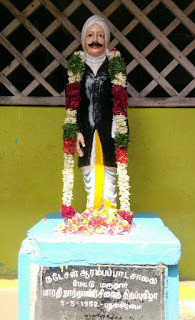 The Head MistressKaliammal mentioned,that Subramaniya Bharathi, the great Tamil genius –poet who emphasized equally on national liberation and radical social reforms. has contributed appreciably in Tamil Nadu the face of women liberation, social equality as well as patriotism.Bharathi is known prominently in Tamil Nadu not only for his patriotic songs but also for his fearless expressions on issues of Jati and women’s liberation. The Head Mistress further mentioned, “Chinnaswami Subramania Bharati, also known as Bharathiyar was aTamil writer, poet and journalist, and Indian independence activist and social reformer from Tamil Nadu. He is known to have said, "Even if Indians are divided, they are children of one Mother, where is the need for foreigners to interfere?" In the period 1910–1920, he wrote about a new and free India where there are no castes. He talks of building up India's defense, her ships sailing the high seas, success in manufacturing and universal education. He calls for sharing amongst states with wonderful imagery like the diversion of excess water of the Bengal delta to needy regions and a bridge to Sri Lanka. Bharati also wanted to abolish starvation. He sang, "Thani oru manithanakku unavu illayenil intha jagaththinai azhithiduvom"translated as " If one single man suffers from starvation, we will destroy the entire world". participation in politics. He advocated greater rights for women and their education. He visualised a modern Indian woman at the vanguard of society. He was of the strong opinion that the world will prosper in knowledge and intellect if both men and women are deemed equal. He condemned the Shashtras, the procedures formulated by some orthodox Hindus and weren't held as holy by most Hindus, that suppressed women's rights. Most of his views are considered contemporary even in modern times. He is known to have said, "Even if Indians are divided, they are children of one Mother, where is the need for foreigners to interfere?" In the period 1910–1920, he wrote about a new and free India where there are no castes. He talks of building up India's defense, her ships sailing the high seas, success in manufacturing and universal education. He calls for sharing amongst states with wonderful imagery like the diversion of excess water of the Bengal delta to needy regions and a bridge to Sri Lanka. This is one of the best informative post. I will move on your blog again to get more information.. Thank you for sharing such knowledgeable post.